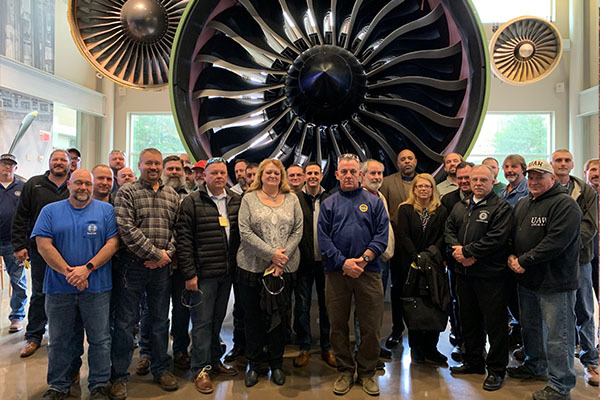 The entire General Electric Coordinated Bargaining Committee (CBC), a coalition of 11 unions including the IAM, recently came together to tour the Evendale GE Facility in Cincinnati, discuss upcoming negotiations and establish subcommittees. CBC Chairman/IUE-CWA President Carl Kennebrew set the foundation and provided the vision for the negotiations scheduled to start in June 2019. Bargaining subcommittees and chairs were named during this gathering. The chairs named include IAM Collective Bargaining Director Craig Norman (Retirement Chair), UAW Representative Gary Jordan (Health and Welfare Chair) and IUE-CWA Conference Board Chairman Jerry Carney (Language and Wage Chair). The unions of the CBC will make sure their members’ concerns are addressed and will work hard to secure an agreement that makes life better for the members and their families. The CBC main table committee, subcommittees, and GE Bargaining Committee’s Health and Welfare subcommittee recently met to work on the upcoming negotiations and proposals.